Transitions always occur around my birthday. Have you noticed that too? A few months ahead, I start to (metaphorically) itch. Inevitably, several aspects of my life, ones I used to love, begin to feel like a prized shirt mistakenly washed in hot water - too tight. It might be my connection with a health care provider, a business consultant, or a personal relationship that needs to change. I tend to be insanely loyal. It’s not easy for me to release what I've previously cherished even when signs appear like newborn criticism, irritation, or anger. In the past, I didn’t release these elements gracefully. I needed to create a drama to inflame my righteousness and thus buoy my courage. Now, when the clues appear, I know I’m shedding so I can step lightly into the new. I do my best to let go with kindness. I honor all the goodness I’ve received from the person or situation without making a ruckus about my new-found infantile irks. I understand, it’s time to step into uncertainty. These shifts begin as early as three months before my birthday and may continue a bit past it as well. The time around your birthday marks a solar return and a new phase of personal growth according to astrology. There’s nothing about career, aside from a conflict in work-life balance (yet again). Your True Calling: Could There Be More Than One? Which brings me to this uncertainty about my true calling. You would think I would know my true calling by now. But, at least for some of us, it's not a single life-long pursuit. As a young girl, I wanted to be a writer. But in early adulthood, I got sidetracked into high stress organizational work. Many years later, when I finally established myself as a freelance writer, I felt like I’d come home. But, now - like that tight shirt once again - this isn't the right fit. I'll keep writing on my blog because I do feel called to share and support you as best I can. 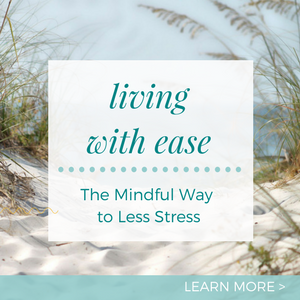 And, I would love to create more courses like Living with Ease, The Mindful Way to Dissolve Stress, but on different themes. But something else beckons me. Though I don't know quite how it will manifest, I've had clues. I sense it's about going deeper spiritually, learning to walk between the two worlds, birthing a new aspect of myself, and healing my connection with the earth. At the same time resistance remains strong. I wonder, "Could it be the uncertainty? Could it be not knowing what's next?" As I write this, lava flows toward our nearest town (10 miles away). The speed of its movement is uncertain and changes every single day. In the weeks to come, the lava may cut the town in two and disconnect the main highway to our community. Or it may suddenly stop. Life seems uncertain for almost everyone here right now. Will they have a job and will they be able to reach it? How will they manage to take their child to school on the "other side?" Will the lava take out electrical poles, turning off the power indefinitely? Will this brilliant flame flow all the way to the ocean, cutting us off entirely? Let go of the old (destruction) and move into the new (creation). Be ready to twist and turn with your unfolding karma, but also know that you create new karma with every thought, word, and deed. Explore the cracks and fissures of your unconscious mind. Be flexible, optimistic, and adaptable. I'm grateful to the molten lava, which made this remarkable land and continues to grow it inch by inch. She was here first. It's up to us to honor her, adapt, and face the truth of impermanence. What do I do in the midst of this inner and outer uncertainty? I'm also reading Digging Deep, Unearthing Your Creative Roots Through Gardening. I'm spending more time in the orchard - cardboard mulching, planting lemon grass and comfrey to keep weeds away from the crown of each fruit tree, and inserting cuttings of perennial food plants into the earth. I'm experimenting with short mini-retreats, a few hours of healing meditation practice on select days. I'm moving toward what calls me now, like the lava, inch by inch. It doesn't need a name. It doesn't have to be an occupation. It's okay to be uncertain. That’s actually how life is. The secret is to gently lean into uncertainty knowing that destruction gives rise to creation and that the cycle never stops. Lava Update: The lava has redirect itself and is no longer an immediate threat to Pahoa town.